At least, that’s the case for a lot of us music fans. We want an aura of authenticity. We want to know, especially in a world of self curation, that what we’re listening to is real. That it’s pure, high-proof and untainted by artifice, that the notes have a ring of truth. That the things we care about matter. We’re all familiar with the story of Seasick Steve by now. Left home in his teens to escape an abusive stepfather, became a hobo; worked a variety of manual jobs in rural southern America; went on Jools Holland, played a guitar made out of junk, and became famous. And then, a couple of years ago, the inevitable backlash: Seasick Steve was a fraud. The man who sang about boxcars, busking and living under bridges had also spent many years working as a session musician and studio engineer. He’d even produced a Modest Mouse album. This wasn’t a man who’d sold his soul at the crossroads; he was a liar, one ten years younger than he claimed to be. Except that’s not quite the case. The truth, as with a lot of these things, falls somewhere in the middle. True, he’s a bit younger than he said he is, and he has played on some dodgy 70s disco recordings; but despite leaving the railroad behind in 1973 and settling in semi-respectability, those formative encounters with destitution have left their mark on him. When he arrives onstage in his John Deere cap, patchwork jeans and ZZ Top beard, it’s clear that this isn’t just a persona; it’s a real person. Not that any of those in the Olympia care about any of this (and nor do we): they’re on board from the start. Seasick Steve is the first of two big hitters to visit West Derby road this week, and it’s good to see the venue so busy following the contract they signed with Eventim earlier in the year. First though, it’s Prinz Grizzley. His Austrian-inflected Americana is an odd proposition, one a bit more polished than the headliner, but he and his band impress with their take on the blues. 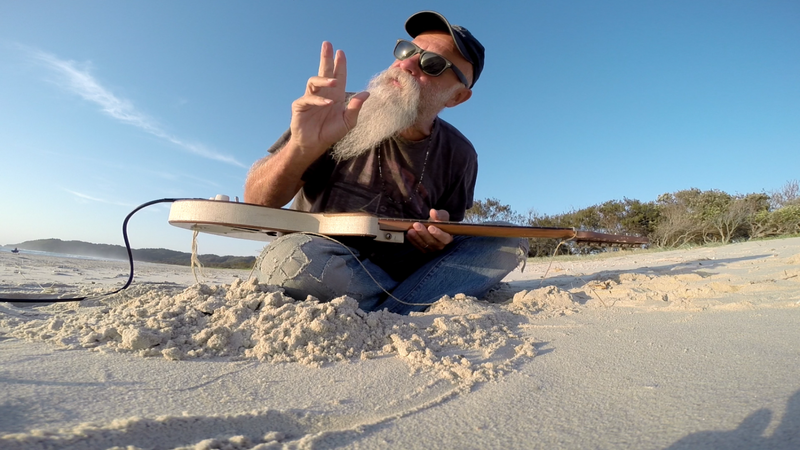 Seasick Steve appears to oddly plaintive calls of “Steeeeeve-O, Steeeeve-O”. It sounds, as he observes himself, a bit like booing, but it’s not; this crowd (in which long white beards and dungarees proliferate, let’s be honest) is well up for it. Reach album Can U Cook? is a bit bland for our tastes, but it’s in the live arena where he comes into his own; where the rust and the feedback comes to the fore. The amount of noise the man can wring out of a guitar is impressive. One song sees him using it as some kind of plosive percussion instrument, getting deep-sea ploops from it by playing it like a washboard – mainly because that’s what the scratch plate is made from. One song ends with him slowly downtuning a single-stringed banjo thing, which comes close to reaching Sunno))) levels of brown sound. Licence plates, paint tins, banjo necks; they’ve all been requistioned and converted into guitars. We’re sure he don’t (damn, that Sountern vernacular is infectious, isn’t it?) play the same guitar twice in the whole set. Highlight is Down on the Farm; what starts off as a standard blues lament turns into a bit of an odyssey, what with the tremolo-drenched noodling of his guitarist. Also worth a meniton is long-time collaborator Dan Magnusson on the drums. His fills hit you right in the chest. Steve closes with Insta This – an invitiation to spend a bit less time on your phone, to embrace authenticity a little bit more – followed by Thunderbird from his breakthrough album. It’s on tracks like this where he comes into his own; where he can rise from his comfortably padded chair and dance and cavort in front of the crowd. Because really, what’s wrong with a little myth making? When he’s in full flow, Seasick Steve looks like he knows exactly who he really is. Yes he was excellent. And had a great back line of talented musicians. I am glad you agree that the truth about Steve is somewhere in the middle. The media do love to twist and sensationalise stories but then try to put the blame squarely in the musicians corner if they get found out. I never thought he was a fraud. I have no doubt he was destitute and rode the trains and the most genuine thing about him is his music. That stands for something in this day and age of talent shows and soulless fabricated music just for the purpose of creating money and ‘likes’.